There was a time when I couldn’t do more than 1 or two pull-ups at a time. Which is why I was interested when I saw a machine that gave assistance during the pull-up. I used it. 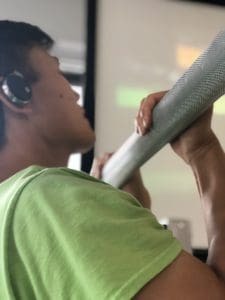 I did sets and reps of the pull up for the first time. My problem was that I felt like I wasn’t doing much of the work. I didn’t believe that I would ever get strong using the assisted pull-ups machine. The American Heart Association (AHA), the American Association for Cardiovascular and Pulmonary Rehabilitation (AACPH), and the American College of Sports Medicine have all recommended getting stronger by doing one set of 8 to 15 repetitions of an exercise. the weight should be heavy enough to cause voluntary cessation within 8 to 15 reps. The grip is usually pronated, supinated, or palms facing. The exercise is sometimes called a pull-up when the grip is pronated and a chin-up when the grip is supinated. 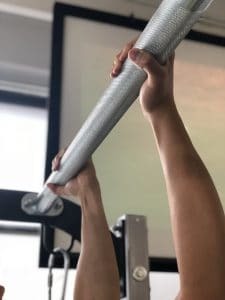 The exercise commonly starts from a dead hang and finishes when the chin is at or over the bar. 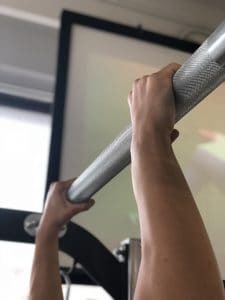 There are two essential anatomical movements that move the body from a hang to the bar: shoulder adduction and elbow flexion. They both happen through nearly a full range of motion. Select the assistance that allows you to do at least 8 reps but not more than 15. Go through a full range of motion during each rep. Decrease the assistance when you are able to do more than 15 repetitions. There are multiple ways to assist this exercise. There are also a number of non-assisted ways to learn how to do it. To figure out the best way for you, come talk to us at The Training Station Gym.